Straight from the highlands in late winter, although this dish is rich, is it addicting! It’s also a great dish to warm you up on those cold winter evenings. 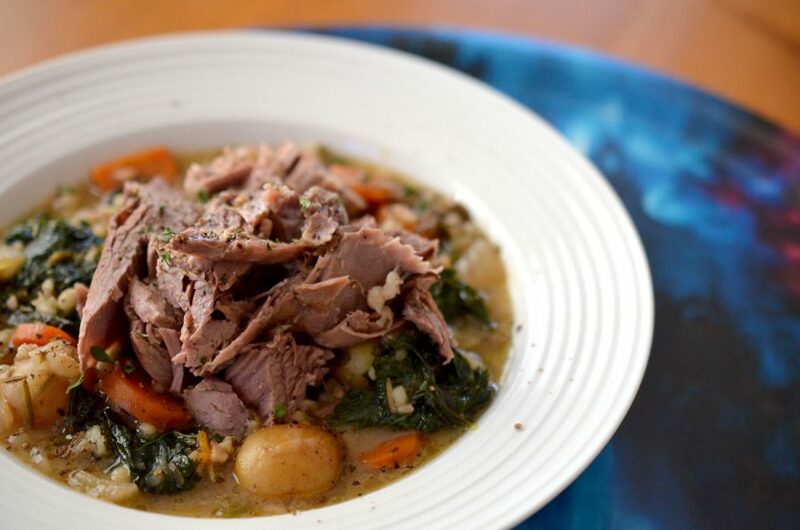 I present the Scottish leg of lamb with barley, root vegetables and kale (what? I was using up ingredients in the fridge). The barley makes the vegetables so creamy and the herbs and beer give a perfect flavouring for the lamb, it’s a definite winner for rich left-overs and keeping that fire burning. Preheat the oven to 325F. In a large dutch oven, heat the oil over medium heat. Season the lamb with salt and pepper on all sides and place in the dutch oven. Sear on all sides – this helps to lock in the moisture and add some extra flavour. While the lamb is searing, prepare the other root vegetables. As part of prepping the garlic, carefully take the flat side of the knife (obviously working to prevent cutting yourself) and smash the garlic. This will help to release all the oil and fragrance and flavour of the garlic. Add the smashed garlic cloves, potatoes, stock, beer, onion, rosemary, thyme and barley to the dutch oven or place all of the ingredients (except the kale) in a slow cooker. Cover with the lid and place in the oven for 3-4 hours or set the slow cooker to low for 8 hours. Remove the lamb from the dish and place on a cutting board. Slice to desired size; set aside. The remaining vegetable mixture will now be rich and creamy thanks to the barley. Mix in the lemon juice (this will balance the richness and add a little brightness to the mixture) and kale. Let sit for 5 mins to allow for the kale to wilt. Serve in a shallow bowl with the vegetable mixture on the bottom and the sliced lamb on top.